Born Auburndale, Wisconsin, June 12, 1952; married; 1 child. Graduate Auburndale High School, 1970; B.A. in Broad Field Social Studies, Political Science and Coaching Minor, University of Wisconsin-Stevens Point, 1975; M.A. in History, University of Wisconsin-Whitewater, 1986. Full-time legislator; substitute teacher; softball and baseball umpire. Retired teacher, Milton School District. Former Parks and Recreation Director, City of Milton. Former Milton High School basketball, football and softball coach. Member: Farm Bureau; League of Conservation Voters. 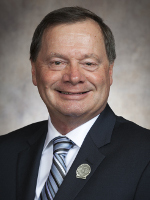 Recipient: Wisconsin Property Taxpayer Champion Award, 2018; Education Technology Appreciation Award, 2018; Channel 3000 Top Notch Teacher, 2011; Milton Athletic Hall of Fame, 2011; Wisconsin Fastpitch Coaches Hall of Fame, 2014; Milton Chamber of Commerce Lifetime Achievement Award, 2014. Milton City Council 2011–15 (president 2014–15); Milton School Board 2016–2019.